PhotoDialer looks like a photo album, operates like a SpeedDial! PhotDialer makes dialing simple and straight forward. Simple Program, Push and Call! Connects to ANY analog phone! Instead of straining to read the small type of a telephone directory, or committing a telephone number to memory, now you just pick up the receiver, find the photograph of the person you want to call, and touch the button next to the picture. FotoDialer does the rest. FotoDialer is not a telephone, it’s an accessory to your digital or analog telephone on an analog line. This new invention will simplify telephone calling for Elderly people who have difficulty seeing the keypad or dialing the correct number sequence. For some, a faltering memory can make telephone numbers hard to remember. FotoDialer makes it easy for the Elderly to stay in touch with family and friends again. FotoDialer is an especially valuable safety tool for the young. In an emergency, dialing 911 is easy with FotoDialer. Pre-printed flash cards allow you to call 911 for fast, uncomplicated dialing to emergency responders. Telephone numbers to parents’ work or cell phones can be programmed into FotoDialer allowing children to contact parents in an emergency by finding Mom or Dad’s picture in FotoDialer and touching one button. FotoDialer won’t interfere with your telephone. Just dial the number as you normally would. FotoDialer is portable and will work with any analog or digital telephone on an analog (non Voice Over IP) line. If you want to change numbers to match new pictures, reprogramming is quick and easy. Click here to download the PDF version of the FotoDialer User Guide. A: FotoDialer is a telephone assist device that allows the user to dial a person or place by touching a button next to their photograph. Q: Is FotoDialer a phone? 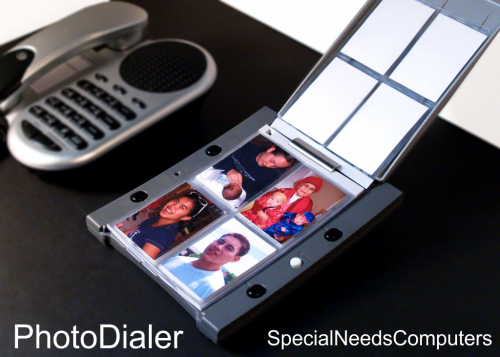 A: No, FotoDialer is a telephone assist device. FotoDialer enables your existing telephone to become an emergency telephone, an elderly telephone, a telephone that removes the barriers of communication previously encountered by some, or just a fun new way to make telephone calls. It connects to your existing phone and aids in dialing, but is not a phone. Q: Isn’t there already a “photo phone” out there? A: There is nothing quite like FotoDialer out there. Picture phones don’t have the amount of numbers that can be programmed in, wear out, and you have to have very small pictures for it. The problem is that most people don’t have pictures that small, don’t have the equipment to make pictures that small, and cannot see such small pictures anyway. Q: Who is FotoDialer for? 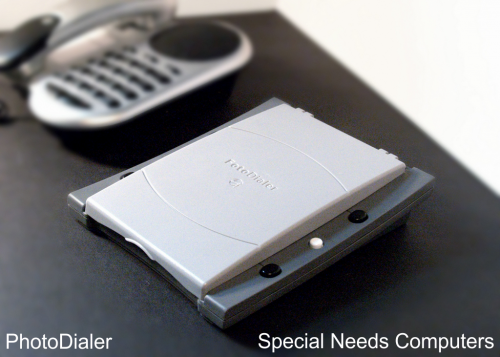 A: The FotoDialer is especially useful for the elderly, children, the disabled, the blind and visually impaired, and those that have difficulty using a telephone. However, anyone can use FotoDialer. Q: Will FotoDialer work with my phone if I live outside the United States? A: Yes! FotoDialer has been sold in countries all over the world and was engineered to work with almost any phone. As long as the phone line is analog, there should be no problems. Q: How can the blind and visually impaired use FotoDialer? A: When making calls, most users that are blind or visually impaired have to find the number “5” digit with a small dot on their telephone and go from there to make the call. FotoDialer allows them to just pick up their handset (or use the speaker button) and press a single button to make a call. Braille or raised symbols can also be attached on each slot to represent a person or place. Most blind and visually impaired cannot read Braille so we suggest using a symbol system for them. Ex: a circle can represent your “growing” husband. Q: Do you have any suggestions on how to help those with Alzheimer’s disease or other dementia diseases use FotoDialer? A: Yes, some Alzheimer’s organizations have told us that most people that have this disease will often remember the happiest times in their life. Because of this, we suggest putting in pictures of people from that time. Ex: if Grandpa Smith’s happiest times were when his daughter, Jennifer was 12 years old, put a picture of Jennifer at that age into his FotoDialer. This is the case even if Jennifer is now much older. Note: this is not the case for everyone with a memory problem as all people are different, but it may help. Q: What size pictures can I place in FotoDialer? A: The pictures can be up to 2" x 3" | 5 x 7.6 cm or wallet sized. If you cannot get a picture, you can just write the name or place with a marker right on the plastic pages. We suggest using a dry erase marker if you decide to write on the pages. Pictures are the best option though. Q: Do any of the pages come preprogrammed? A: No pages come preprogrammed. 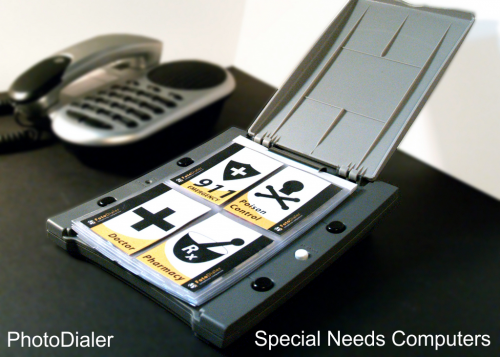 FotoDialer comes with preprinted flash cards on the first page for emergency contacts, but none of those are programmed yet. The user must do that because of different numbers in different areas. Q: Do I have to buy a special phone that will work with the FotoDialer? A: No, FotoDialer will work with any analog phone you already have. You do not have to get another phone or throw the one out that you have now. We do suggest getting a newer phone if you only have an older one. It doesn’t need to be expensive or fancy. If you do have an older phone, we suggest trying FotoDialer out before getting a newer one. Note: most home phones are analog. Q: FotoDialer works with any analog phone line, but will it work with one that is a cordless phone? A: Yes, FotoDialer works with corded phones and cordless phones that are analog by connecting to the base. Q: Will FotoDialer work with my cell phone? A: No, FotoDialer will only work with analog phones, so cell phones will not work. Q: What if I want to make a call without using FotoDialer; do I have to disconnect everything? A: No, you can use your phone as usual even while the FotoDialer is connected to your phone. Q: Will FotoDialer work at my office? A: It depends; FotoDialer will not work with digital or VoIP lines. That model may come later. Again, FotoDialer will work on any analog phone line. Q: How many numbers can I program into FotoDialer? A: A total of 24 numbers can be programmed into FotoDialer. Q: Can FotoDialer call long distance? A: Yes, FotoDialer will call any number you program into it and that your telephone can call. Q: Is it difficult to set-up and program FotoDialer? A: No, the set-up and programming takes just a few minutes. We do suggest that people with disabilities or who are elderly receive help to set-up and program. Q: Are there instructions on how to set up and program FotoDialer? A: Yes, all FotoDialers come with instructions and a 1-800 number to call in case you need help. There are also instructions on the website under the User Guide tab. Q: What if I move? Do I have to reprogram all the numbers? A: No, the telephone numbers remain programmed into FotoDialer. However, we do suggest programming the area code into all the numbers. Otherwise you will have to reprogram all the numbers into FotoDialer if you move into a new area code. Q: Can I take FotoDialer with me on a vacation or business trip? A: Yes. Just remove the FotoDialer and take it with you. Remember to take the connection cord with you. Note: FotoDialer will work with any phone you connect it to (at a motel for example) as long as it is an analog phone. A: Yes, FotoDialer is made from high impact ABS. Q: What if the power goes out or my batteries die? Will I lose all the numbers I programmed? A: No, all the telephone numbers programmed in will stay in the memory even if the power goes out or the batteries die. Q: How often do the batteries need to be replaced? A: The batteries should be good for at least 18 months. However, it does depend on the kind and amount of use they get. There is no guarantee. There is a low battery indicator light on FotoDialer that will inform you if batteries are low. Q: What kind of batteries should I use with FotoDialer? A: FotoDialer requires two AA alkaline batteries. A: Yes, we are proud to give a 90 day, money back warranty for customers. Opening or tampering with the unit voids the warranty. We LOVE our FotoDialer! It is easy to use and is just what we were looking for to give our grandmother. It is easy to use, though we had to program it for her. Highly recommend!